675% Deposit Bonus + 60 Free Spins. Slots Village is an online casino site that was established in 2008 by Blacknote Entertainment Group Ltd Casinos. It is licensed by the Curacao Gaming Commissioner and the Government of Curacao. 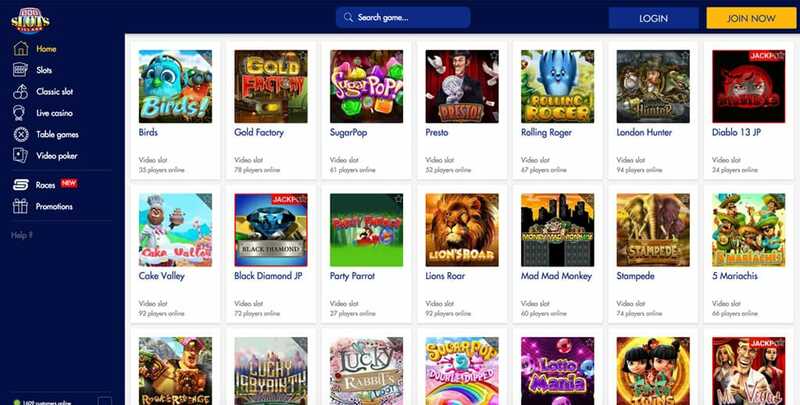 Its goal is to offer casino players the best slot games, but it also has a wide range of table games such as poker, baccarat, blackjack, and roulette, as well as live games. The games are provided by the top game developers like Betsoft, Pragmatic Play, Rival, NetEnt, Microgaming, etc. This means that there’s an enormous library of impeccable, high-quality games. These incredible games come with even more incredible promotions and bonuses. Players can enjoy great offers and enhance their winnings with the daily, weekly and monthly promotions. The sign-up bonus is pretty generous, but the surprises don’t stop there; all of the other promotions are lucrative as well, meaning players will never lack motivation for playing. This review is aimed at providing you with the latest information about the slots website. Read on. 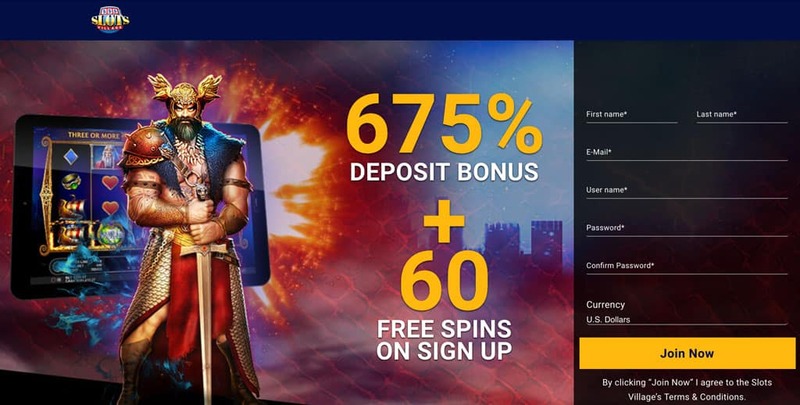 Welcome Bonus: 675% Deposit Bonus + 60 Free Spins on Sign Up. As mentioned, Slots Village provides its players with daily, weekly and monthly bonuses and promotions. These bonuses include free spins, cash or deposit bonus match. Apart from the Welcome Bonus Package, novice players can also enjoy the New Players Weekly Tournament. On their first deposit they get great rewards! With each €1, they get one point. Getting to the top 20 gives new players a chance of winning up to €200. Second place gets €100, and third place gets €50. Those players that play using bitcoins also get some beneficial promotions. If they make their first deposits with bitcoins, they get an amazing 400% bonus match. The weekly promotions also offer something for anybody’s taste. You have the Sunday Storm, where on a minimum of €50, you can get up to €2,500! Now, that’s a nice bonus offer, right? OR, during Sundays, you can also take part in the Sunday Super Reel and on the minimum of €25, you can get up to €1,500 if you’re first place. But those from 11th to 25th place also win – amazing €50! But there are also some specific promotions. For example, you have the Table Games Bonus, where you need to wager at least €10 on any table game and win big – up to €500! 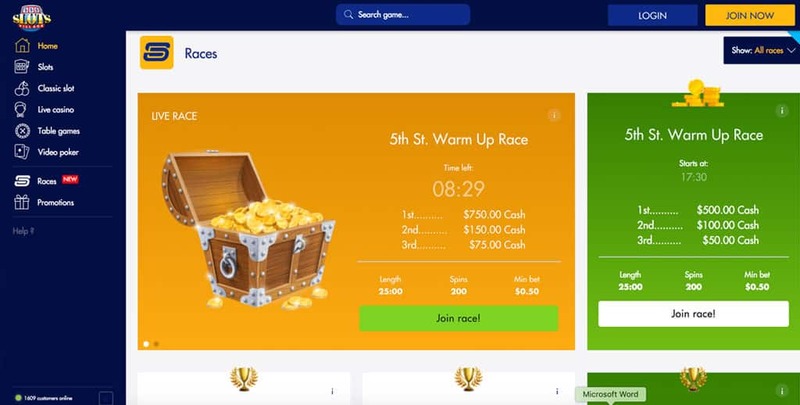 You also have the Thermal Thursday, The Hot Streak Harley, Tournament Time, The Grand VIP Tournament, Mission Impossible – Fallout, Loyalty Cashback, and the upcoming 5th Street Races. Newcomers can enjoy the benefit of getting 60 Free Spins on their Sign Up, but also an incredible 675% bonus match on their first deposit. All they have to do is create an account for free, get 60 Free Spins immediately upon signing in, and start depositing. On their first deposit, they get 675% deposit match to spend on +200 games. Currently, there are no Bonus Codes for the offers and promotions on Slots Village. However, stay tuned and keep track of the promotions and offers, and check them well before claiming them. Slots Village can require promo and bonus codes in their future offers, so before thinking of claiming an offer, see whether a code is required. As soon as you visit Slots Village, you will notice that it is mainly focused on slot games, which is obvious from the name of the casino itself. There are more than 60 slot games, the majority of which are video slots, but there are also classic slots. Some of these slots offer the possibility of juicy progressives. Slots Village Casino will impress you with its collection of slots that feature impressive jackpots. Most of these jackpots are valued at $50,000, $75,000 and $200,000. All these jackpots are random which means you can hit them even on the first spin! The casino site is powered by Parlay Entertainment software which is known around the world for its 100% mathematical accuracy and fair gameplay. All games are run by a unique random number generator which ensures the games are entirely fair. Rigging a game is not possible which means the players are never cheated. When you are at Slots Village casino, you do not need to worry about your safety as they have already done everything to offer entirely secure banking. Nobody in this world can intercept your banking details while you are making deposits or withdrawals. You can make deposits and withdrawals using your credit or debit card issued by VISA, MasterCard, Discover and American Express. You can also use EcoCard. NETELLER and INSTADEBIT banking are also available. Getting in touch with someone when you are in trouble is easy. You can send an email round the clock at [email protected]. They usually reply within 24 hours. You can also get in touch with them using their helpline number which is toll-free. The number is 1-800-274-7345. For faxing, you can use the number 703-991-8879. If you want them to call you, you can leave a request using their website. On top of everything else, there is a Live Chat Support team which is available 24/7 to answer your queries. Slots Village is a real home of slots. You can enjoy so many popular but also rare and exotic slot games in the form of video or classic slots. If you’re a slots freak, then this is the online casino for you. The bonuses and promotions are perfect, as well as the quality of the games. But if you are a more of a try-it-all player, you can also take advantage of the standard table gamed and play a round of blackjack, poker, baccarat or roulette. Just sign up on Slots Village, use the Welcome Bonus Package and all of the consecutive deposit bonus matches and you’ll have a pleasant and extremely rewarding experience!